There we go, that’s what I was talking about. This is now starting to have that classic cab appeal, I like where you’re going with it. I’m not sure if I’m sold on the starfield version, I’d have to mull it over a bit. But the ghosts are looking good like that, IMO. I like the way the red ghost seems to look and point at you like "C'mere and play!" I'm not sold on the starfield version either but I'm not sure I like the blank space and I don't think it will translate when printed. I'm not sure how to fill the blank space, it just seems to black, but I have a few thoughts I'd like opinions on and other suggestions. Thinking about any one or combination of these. 1. Add a color gradient to the background, maybe blue to black from the bottom up. Sort of the glow from a Pac Man maze. 2. Add some blue Pac Man maze lines into the background. Maybe just subtle along the back top, back, and bottom edges of the cab. 3. Sprinkle elements from the original image into the blank space. Could add the pill bottles, pills, or box easily. Not sure this will look right if they are just floating in the space, maybe overlapping the ghosts with these elements or vice versa. 4. 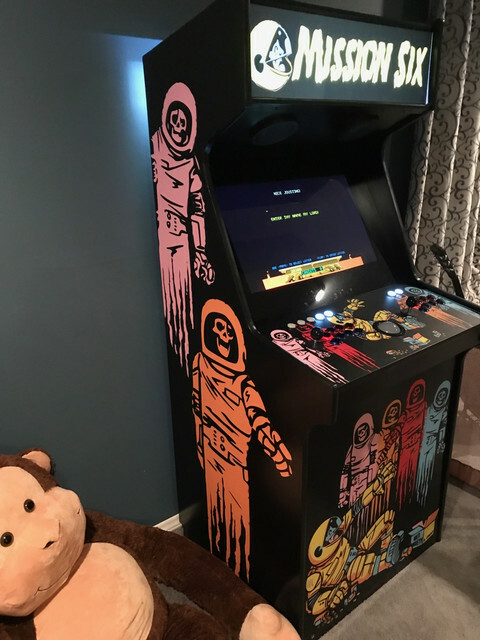 Color and add an Atari logo in the background. Just the "swoosh" no actual text. As scene on the Astronauts shoulder. 5. Add the cabinets title or some other words to the back ground. The art is called "The Madness of Mission Six" and I'm thinking of calling the cab "Mission Six" (open to suggestions). Could put that behind the blue ghosts head to fill in the top blank area. Alternatively could put a yellow "MADNESS" in a strong font running vertically behind the ghosts. 6. Could change the entire background to a different color. Dark blue is out because it's the color of the walls where my cab will go. All of those are a big no for me. Keep the concept focused. If you don't like the black, try a different solid color. The black looks fine to me though. Bouncing around a lot of different areas on my cab. All the panels are now cut and started painting. Working on a LaunchBox setup but haven't gotten to deep in that. 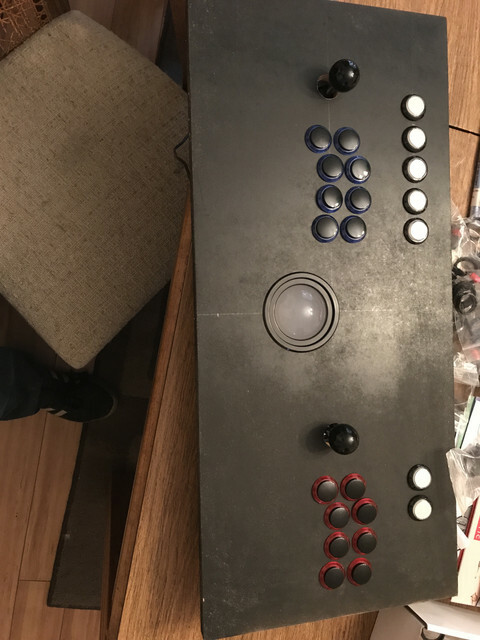 Ordered a bunch of parts, marquee light/holders, amp, speakers, and buttons. T-molding.com has been great for all this, really fast shipping and very responsive to any questions I've had. Still need to order my track ball and joysticks along with a control board. Placing Ultimarc order soon. Hoping to mock up the cabinet tomorrow before I finish the painting. Working on artwork this evening. Would love some feedback on my latest revision. Artwork has been vectorized. I think this might be the final version of the side art. Other side will just be a mirror image. The ghosts on the other side should be pink and orange. Depending on whether you show the entire picture somewhere else or not, the significance of the box of pills might get lost. If you don't know that it's a PacMan reference, you might wonder why the ghosts hover over that box. Are the right eye sockets intentionally empty? In the original pic both eyes have pupils. Yea that's what I'd like to do but the pink and orange ghosts are cut in half in the original image. 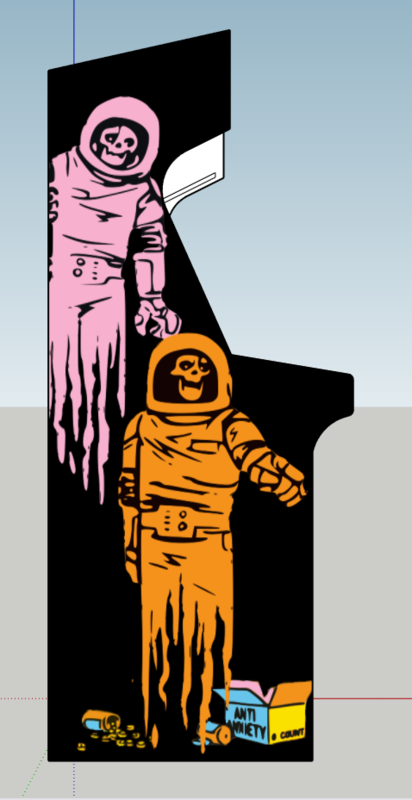 I was thinking about trying to recolor the red and blue ghosts to pink and orange. I basically have no idea what I'm doing with graphics programs, gimp and inkscape, so I'm just muddling my way through this lol. I'll have the entire picture on the cabinet. Most people I know don't get it's a pacman reference to begin with lol. I felt like there was to much empty space around the red ghost so the box kind of breaks it up a little. The pupils and a lot of detail were lost when I vectored it with Inkscape. Might try to add the missing pupils back in but I don't think it looks bad without them. On the advice of javeryh. It was kind of weird getting the colors swapped out in Gimp. I lost some detail in some areas and gained some in others. Overall pretty ahappy with the results. Might move the box to the top layer to see if it adds any depth. Glad you said that because I would not have thought of that. I'll probably just flip the ghosts and not the box. Hey I don't know if you're checking your PM's, but I sent you one. Would be nice to get a response. thx. Hey didn't notice I had a pm. Response sent, thanks. Would love some feedback on the marquee design. Take the characters off of it. Text only. This. 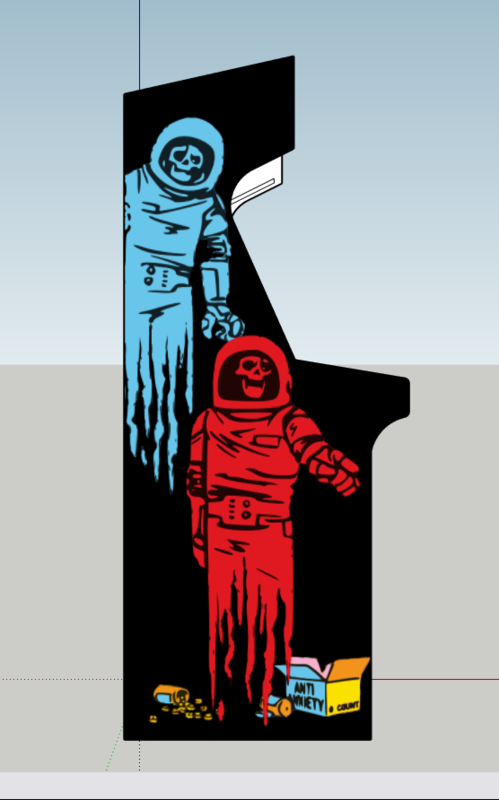 It looks like the astronaut is afraid of the logo, the ghosts are too small. I think it's to plain with just the text. Might play with it a bit. Maybe decrease the font size and make the characters bigger. Right in most cases. But what arcade cabinet have just text for a marquee? I would hardly call my design overly complicated as is. You are right about that. However, the stark, plain marquee conveys the hopelessness of the main character. I like where you are going with the artwork. The characters on the marquee look good too. "Anti-anxiety" box text is reversed on the right sideart. It's also way too clean and crisp. I would make it a bit more "drawn" looking, something that matches the roughness of the ghosts and pill box to be consistent throughout all visuals. I'd also add some of the colours from the rest of the images into the marquee, whether through outlines or a drop-shadow. Something to colourize it more. Fix that reversed box text. A box and some pills on the marquee would look better that the ghosts and astronaut. Actually mocking up a few different things like this now. Yea that's on the "to do" list. Mostly just mocking things up right now. Agree with that but I'm not really sure how I would even begin to make it look "drawn". Drop shadows I think I can do. On the flip side, it's supposed to be a Namco font which I kind of like because it ties in with the PacMan theme. So I've mocked up a few more Marquee. These are all quick and dirty without vectored art, just trying out concepts. Do some kind of subtle nebula background. ps. box on other side in second pic to stop the yellow colour clashing? Second that. Star field with as Opt2not suggested a more hand drawn font and introduce the other colors....maybe like Zaxxon? Still no hand drawn font, but I like it. Maybe it's a starting point. Really digging the artwork man. 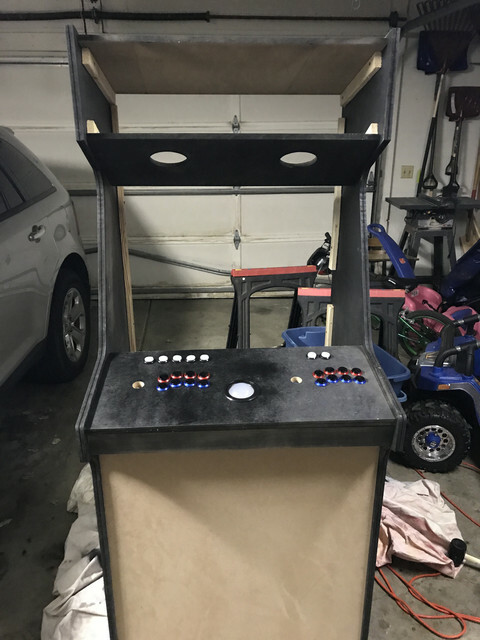 This is going to be an amazing cabinet when it's finished. 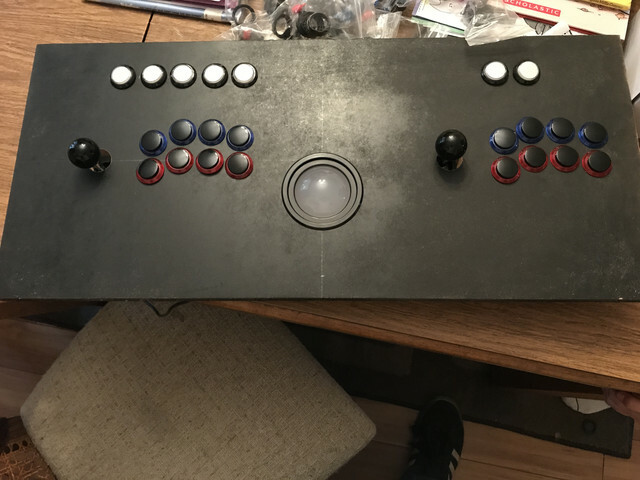 Drilled out my CP and mocked up the controls. Think I'll do blue and red for both players but originally planned on blue for p1 and red for p2. Player 1 and 2 are not symmetrical by design. 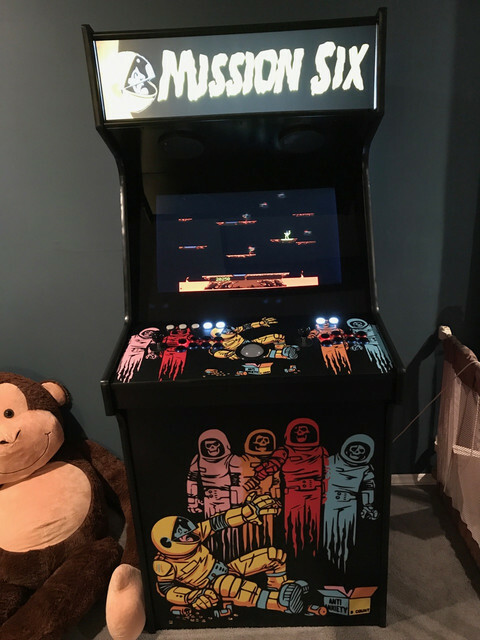 Had to move some things around to comfortably fit the controls I wanted. After the pics I recessed the area for the trackball down to 5/8" so it sits nice and flush. Any tips on mounting the servo sticks under the cp? It's 3/4" mdf. I bought the blind hole mounting kit from ultimarc which is for 3/4" and 5/8" panels. I can route it down to 5/8" but I'l not sure that's going to be thin enough. Should I go down to 1/2" and get shorter bolt inserts(what are those called anyway)? Should I route to 5/8" and leave it? What about route to 5/8" and get a longer shaft? I might do led anyway, is there a longer led compatible shaft? First time I've had it fully mocked up. Everything fit surprisingly well. Still a lot of work to do but really excited to have a cabinet shell standing in my garage right now! What color t-molding will you be using? Been awhile since I've updated but have slowly been making progress. 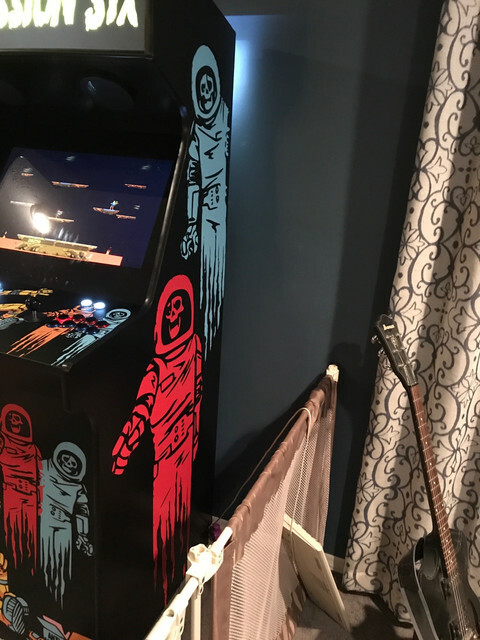 Artwork is sent over to GameOnGrafix for print, control mounting hardware is installed in the CP. Gotten a bunch of work done on my frontend, starting to look nice. Off work till after the new year so hoping to have the artwork in a couple days and have the cabinet put together before I go back. Pretty much done. Pics at the start of thread. The trackball placement is a bit too... spot on.